YANGON — The Myanmar military shut down a Chinese-contracted US$500 million high-rise project after the developer breached the memorandum of understanding signed between the two sides. The Myayeik Nyo high-rise project on more than 13 acres of land in Yangon owned by the military was slated to have 12 buildings with heights ranging from 382 to 412 feet built by the Zaykabar Company. The company chairman U Khin Shwe said the project, scheduled for completion in 2020, was a landmark investment for Yangon and would feature both hotel space and serviced apartments. The project contractor was the China State Construction Engineering Corporation. On Wednesday, the military announced during a press conference that it had informed the developer since May not to carry out construction-related work, as the project was terminated. The announcement came more than a week after Hunan Province Vice Governor He Baoxiang and a delegation visited the site late last month and the company suddenly changed the project name to Yangon New World Project. During the visit, U Khin Shwe said 40 percent of the investment was to come from Zaykabar while 60 percent was from the Chinese company. U Moe Min Win, the secretary of the Yangon Cantonment Board, which manages military-owned land in the city, said Zaykabar Company didn’t follow the agreement signed in January 2014 with the Quartermaster’s Office. He explained that in spite of its agreement with the military to pay the land use premium five times in two years in different amounts in order to meet the total US$41.328 million, the developer had only made two payments. “Even with all of our repeated warnings, they still have not finished the payments,” U Moe Min Win said. 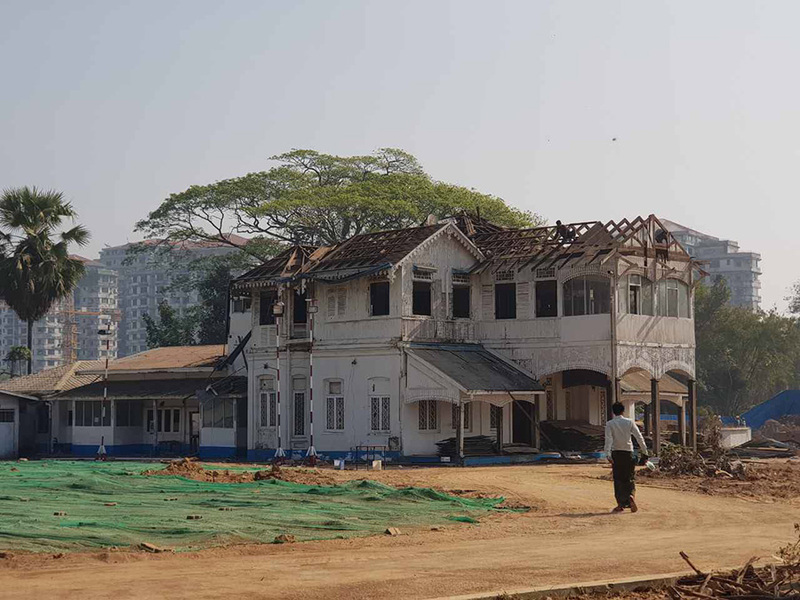 Apart from the payment failure, the secretary added that the developer had demolished two heritage buildings on the project site, a breach to the memorandum of understanding that only allowed soil tests rather than site clearing upon the second payment toward the land use premium. He added that no foreign investment for the project was allowed yet. “We haven’t signed a build-operate-transfer agreement yet but the company already built a project-related building on the site. So, we informed them that we have rejected their actions to date and they are no longer allowed to develop land owned by the military,” U Moe Min Wi added. U Khin Shwe was not available for comment on Wednesday evening. Apart from breaching the agreement, the Myayeik Nyo high-rise project was a source of public concern since the beginning. The site clearing early this year sparked public fears that the construction would collapse the 92-year-old reservoir nearby. At the press conference on Wednesday, the Cantonment Board secretary said the military had mentioned that it was aware of the public’s concerns. U Khin Shwe’s Zaykabar Co. Ltd. is one of Myanmar’s largest construction companies. His daughter is married to the son of U Shwe Mann, the third most influential person in the former military regime but now an important ally of Daw Aung San Suu Kyi, leading the military to reportedly see him as a turncoat.